Mollie: Bride Of Georgia (American Mail-Order Brides Series Book 4) by Lorrie Farrelly is a wonderfully written mail order bride tale that takes place in Georgia, a few years after the Civil War. Mollie Winters responds to an ad placed in the Groom's Gazette and, when she receives a response and a train ticket, she heads to Atlanta to become a mail order bride. Nicholas Avinger is at the Atlanta train station to pick up supplies for the zoo when he meets Mollie and learns that she is there to become his mail-order bride, a bride that he knew nothing about! Mollie takes it in her stride and rents a room at the local boarding house, but when she shows up at the zoo where Nick works, he realizes that he needs her help and, more than that, he feels an attraction to her. I loved this book! 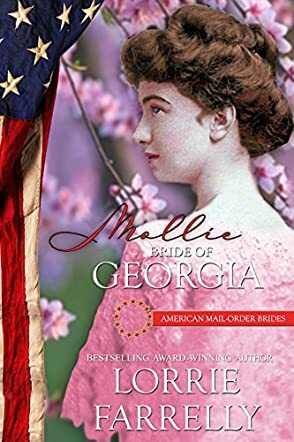 As someone who reads plenty of mail-order bride genre stories, I can say that Mollie: Bride of Georgia (American Mail-Order Brides Series Book 4) was an exceptional read. The reason I say this is because the author not only provides a touching story between the two main characters, she also provides snippets of humor, while also including more than a few twists to a very interesting plot. The historical aspects were very interesting, from the coming together of a zoo, to the diligent rules of pasteurization, and the effects of PTSD. It was really easy to see that the author had done her research, which made for a very readable and relatable story. Lorrie Farrelly creates a very interesting storyline around the main characters. First of all, I fell in love with the strength of Mollie. When she realizes that her intended groom wasn't even expecting her, she didn't swoon or wilt - instead she rented a room and proceeded to try to sell her book. It didn't take long for Nick to realize just how different Mollie was either. Nick, on the other hand, was haunted by issues from the war. Ms. Farrelly handles the subject of PTSD very well, allowing the reader to understand how not all scars from war are shown on the outside. The fear that he could hurt someone he loved was devastating to him, and pushing them away was his only answer. Mollie had other ideas, though. Plenty of secondary characters really round out the story quite nicely. Fans of the mail-order bride genre will find this book a top notch read, but honestly it will appeal to anyone who enjoys historical fiction with a page turning plot that deals with the very real issue of how war affects the soldier long after he comes home.